Over-locked bleached cotton calico so it can be washed and reused if necessary. Fold in half for small children. Quality material which will last due to prolonged use. 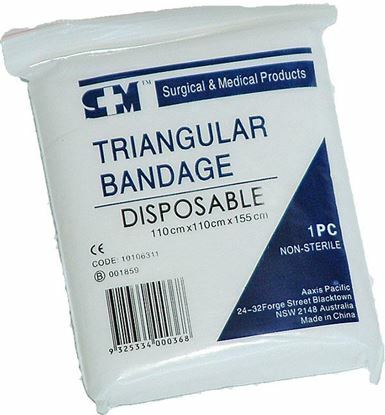 Use for making broad and narrow bandages, slings, splinting, emergency cooling/face filter when moistened, emergency restraint plus many many more uses which is why a triangular bandage is the cornerstone item in a first aid kit and why we only supply the best quality available in bulk quantities we can find. Beware of cheap paper triangular bandages sold by others!